We've known that G.I. Joe was going to get a sequel for a while, but now a release date and cast details have been unveiled. Let's get this out of the way: G.I. 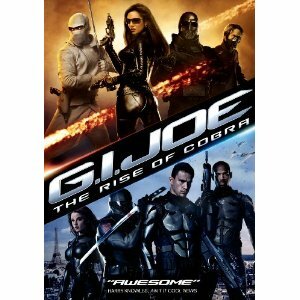 Joe: The Rise of Cobra was a dreadful movie. But it was the fun kind of dreadful that you could enjoy with your friends, provided you went into the movie theater with no expectations other than to enjoy what was obviously going to be a terrible revamp of some beloved childhood memories. That said, the movie made an obscene amount of money, which means that it's got a sequel coming out, and Paramount has finally started revealing details about it. G.I. Joe 2 is scheduled for an August 10, 2012 release date. Box Office Mojo is reporting that "Based on previous reports, it looks like Step Up 3-D and Justin Bieber: Never Say Never director Jon Chu will be taking over directing responsibilities from Stephen Sommers. While no plot is currently available, Rachel Nichols, who played Scarlett in the first movie, tweeted earlier that most cast members would not be returning." Nichols tweet reads as follows: "GI JOE 2 News Flash: The only characters to return in the JON CHU directed sequel will be SNAKE EYES, STORM SHADOW, and DUKE..."
So far, this sequel sounds even more delightfully terrible than its predecessor. That said, it'd be kinda weird if Cobra Commander and Destro aren't included as characters in the movie, but I'm not exactly heartbroken that Marlon Wayans won't be returning as Ripcord. Actually, that's a huge understatement: I totally did a happy dance when I heard that news. Is it wrong that I'm kind of hoping Sgt. Slaughter will make an appearance?